You are formally invited to the 7th Annual Vintage in the City at Raccoon Forks Trading Company on Saturday, March 30. The event lasts from 10 am to 6 pm. We have added a boatload of new inventory for the event. We are also offering 20% off most items in the store and special treats from our pals at Brick Street Bakery in Adel. 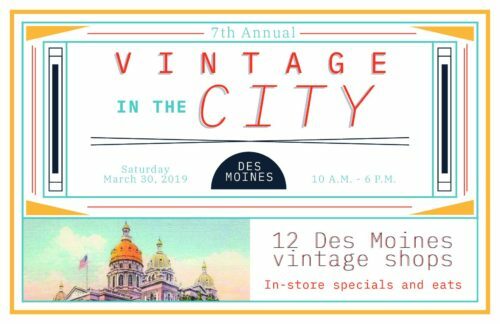 Vintage in the City is a shop hop promoting Des Moines Metro vintage and antique shops. So grab your friends and visit RFTC and the 11 other participating shops for refreshments, in-store specials and shops filled to the brim with fun, unique, vintage goodies!